American journal US News & World Report (USNWR), known for its university rankings, has ranked Pakistan as the 20th most powerful country in the world in 2017. The United States tops the list followed by Russia at number 2 and China at number 3. Among Pakistan's neighbors, Iran ranks 14th and India 16th on the list. This latest ranking by an international publication is yet another indication of the failure of Indian leader Narendra Modi's sustained efforts to isolate Pakistan since he rose to power in 2014. The US News & World Report says it developed the study and model used to score and rank countries with Y&R’s BAV Consulting and The Wharton School of Business at the University of Pennsylvania. The journal says it identified a set of 65 country attributes – terms that can be used to describe a country and that are also relevant to the success of a modern nation. It surveyed more than 21,000 people from around the world to assess each country in terms of these attributes. Survey participants decided how closely they associated an attribute with a nation. Each nation was then scored on each of the 65 country attributes based on a collection of individual survey responses. The more a country was perceived to exemplify a certain characteristic in relation to the average, the higher that country’s attribute score and vice versa. These scores were normalized to account for outliers and transformed into a scale that could be compared across the board. USNWR defines powerful country in terms of "a leader, economically influential, politically influential, strong international alliances, strong military". 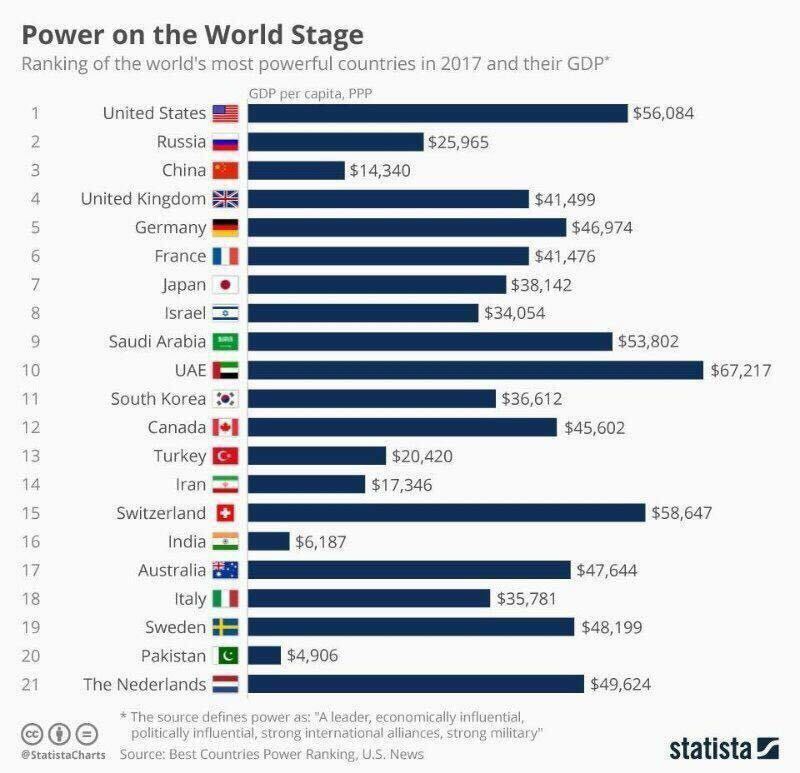 The USNR ranking of Pakistan among the top 20 most powerful countries is yet another indication of the failure of Indian leader Narendra Modi's sustained efforts to isolate Pakistan since he rose to power in 2014. American journal US News & World Report (USNWR), respected for its US university rankings and other international rankings, has ranked Pakistan as the 20th most powerful country in the world in 2017. This latest ranking by an international publication is yet another indication of the failure of Indian leader Narendra Modi's sustained efforts to isolate Pakistan since he rose to power in 2014. Riaz Bhai, during 1930s and 1940s Nazi Germany was the most powerful nation in the world. What is your real point here? Pakistani officials have been worried for months that the Trump administration will put heavy pressure on their government, possibly by cutting aid or even declaring it a “state sponsor of terrorism” – a giant black mark -- due to complaints by Afghan officials, U.S. military officials and members of Congress that Pakistan continues to harbor anti-Afghan insurgents. At the same time, Islamabad has been concerned about Washington’s emerging friendship with India, Pakistan’s much larger, nuclear-armed rival and immediate neighbor. This week’s upbeat state visit to Washington by Indian Prime Minister Narendra Modi, who was received enthusiastically by President Trump, raised new alarm bells here. On Thursday, Pakistani newspapers featured a photo of Trump and Modi hugging goodbye, along with anxious headlines and a testy statement from the Pakistan foreign ministry that called a joint statement by the two leaders “singularly unhelpful” in achieving stability and peace in South Asia, and said it “aggravates an already tense situation.” The ministry also said that China had endorsed Pakistan’s view. Pakistan was especially upset that Modi and Trump spoke about the importance of reining in regional terrorism – referring indirectly to Pakistan’s alleged support for anti-Afghan insurgents -- but ignored Pakistan’s denunciations of human rights abuses by Indian forces against protesters in the contested border region of Kashmir, as well as its charges of Indian support for anti-Pakistan militants. Sir, the USNWR power ranking is a subset (7% weighing) of the Best Country ranking of 80 countries. Whereas Pakistan is 20th in power rankings, it is 74th in the overall Best Country ranking out 80 that were ranked. Your pictograph does indicate #74. That means India is higher by 25% and at one time we were about 40% higher I think in the 1980s. That is a tragedy from poor governance. I don't know how good is all that power. Maybe PM Sharif will use it as propaganda. Pakistan’s predicted annual growth rate over the next 10 years is nearly 6 per cent, according to the revised growth projections presented by researchers at the Centre for International Development (CID) at the Harvard University. This is a one-point GDP increase as in the CID’s earlier projections, Pakistan GDP was set to grow at 5 per cent by 2025. Although China’s huge economy (current GDP at $12 trillion) cannot be compared with that of Pakistan (current GDP at $300 billion), Pakistan’s 5.97 per cent growth rate is above that of China, which is set to grow by 4.41 per cent. Led by Harvard Kennedy School, the research is called ‘The Atlas of Economic Complexity’. The CID’s growth projections are based on the measures of each country’s economic complexity, which captures the diversity and sophistication of the productive capabilities embedded in its exports and the ease with which it could further diversify by expanding those capabilities. According to the Harvard study, the economic complexity not only describes why countries are rich or poor today, but can also predict future growth — about five times more accurately than the World Economic Forum’s Global Competitiveness Index. Pakistan’s neighbour India, on the other hand, is predicted to grow by 7.72 per cent, the world’s highest. The CID believes that the economic pole of global growth has moved over the past few years from China to neighbouring India and it is likely to stay there over the coming decade. Except for India, Pakistan will beat all Asian economies in GDP growth. These also include giant Muslim economies. According to the Harvard study, the central reason for income differences is know-how. Poor countries produce few goods that many countries can make because of the lack of know-how, while rich countries produce a greater diversity of goods, including products that few other countries can make. Harvard’s leading research hub uses this fact to measure the amount of the know-how that is held in each economy. A major trend that emerges from Harvard’s report is that the growth in emerging markets is predicted to continue to outpace that of advanced economies, though not uniformly. In addition to Pakistan, the CID projections are also optimistic about new growth hubs in East Africa and new segments of Southeast Asia, led by Indonesia and Vietnam. it also notes that economies based on commodity output face slower growth rates as commodity prices continue to remain under pressure. With special economic zones (SEZs) being built under the China-Pakistan Economic Corridor (CPEC) project, it is an opportunity for Pakistan to move away from commodity output by producing value-added goods in joint ventures with Chinese firms and increase its exports. This way, Pakistan can have even faster income growth. The Harvard growth projections are in line with other short, medium and long-term GDP growth forecasts for Pakistan. Ask most security analysts, political observers, international relations experts or even your average layperson on the street, and they'd say India's biggest security threat is Pakistan. After all we've shared a long and fraught history since Partition, fought four wars with them and endured terror attacks emanating from their soil. Unsurprisingly, much of Indian foreign policy and defence strategy has been oriented vis-à-vis Pakistan. Unfortunately, India's preoccupation with Pakistan could cost us since it has meant we have neglected other hostile neighbours, particularly China. The result is events such as the ongoing Sino-India border standoff, in which China has been calling for the independence of Sikkim. Another negative fallout is that the India-Pakistan conflict has literally hyphenated the two nations, bringing them on the same level as one another. Our policymakers have not seen China as India's "peer" (unlike Pakistan). Thus, India hasn't really tried to balance out China even in South Asia. Now, both these factors have clear disadvantages for India. Firstly, the "internationalisation" of the Indo-Pak conflict has put the two states as "equal players" on many international forums, almost to the extent where analysts of global politics take the names of these two countries in same breath. Despite being a smaller state than India, in almost every aspect, Pakistan has had the audacity to look India eye to eye. Much of this owes to the fact that India has traditionally punched "below its weight" while Pakistan has done the opposite. The second problem is much bigger. Because India has been so engrossed in dealing with Pakistan, China's growing power goes "unchecked". There is a deeper problem behind this—our policymakers have not seen China as India's "peer" (unlike Pakistan). Thus, India hasn't really tried to balance out China even in South Asia. That is evident in the fact that China has much deeper economic ties with most of India's immediate neighbours than India does. Indian policymakers need to also understand the fact China and Pakistan are all-weather friends. This complicates matters considerably. Yes, India does have international allies but how much can they be relied on? In 1962, when the Indo-China war happened, the then Soviet Union didn't come in support of India openly against China, despite being India's all-weather friend then. Surely, the India of today is a much bigger power than the India of 1962. India's capabilities have increased but so have China's. India is a nuclear power state now but again, so is China. It's high time India develops home-grown defence technologies to reduce the fiscal burden of imports. To sum up, the time has come to re-orient our defence policies. Pak-centric policies won't do much good to India in the longer run. Once India engages to maintain balance of power vis-à-vis China, it would emerge as a much stronger power than it is today. Such a feat will take time and patience but if India succeeds, its influence will grow both in its immediate as well as extended neighbourhood. It will also stymie China's march towards becoming a regional hegemon. With a total military strength of 919,000 personnel, total aircraft might of 951, and a defence budget of $7bn, Pakistan’s armed forces have been ranked 13th amongst the 25 most powerful world militaries, according to a February 26, 2018 report of American financial and business news website, the Business Insider. The American news website, which publishes several international editions in languages including Chinese, Dutch, French, Italian, German, Polish, and Japanese, has actually carried the “2017 Military Strength Rankings” of Global Firepower, another globally-renowned website. Global Firepower’s “2017 Military Strength Rankings” says that it has taken more than 50 factors to assign a Power Index score to 133 countries, because head-to-head military comparisons are harder to draw since weapons sales only indicate which country is beefing up their armed forces. The Global Firepower states on its website that since 2006, it has provided its unique analytical display of data concerning over 130 modern military powers. The Global Firepower asserts that its ranking is based on each nation’s potential (conventional) war-making capability across land, sea and air. “The results incorporate values related to resources, finances and geography with over 50 different factors ultimately making up the final annual rankings. The results provide an interesting look into an increasingly volatile global landscape where war seems an inevitability,” the Global Firepower website maintains. The Business Insider, in its February 26, 2018 report, says: “The ranking assesses the diversity of weapons held by each country and pays particular attention to the manpower available. “The geography, logistical capacity, available natural resources, and the status of local industry are also taken into account. “While recognised nuclear powers receive a bonus, the nuclear stockpiles are not factored into the score. “Moreover, countries that are landlocked are not docked points for lacking a navy, though they are penalised for not having a merchant marine force.